An interesting article in The Guardian reported that, based on a survey of 1,007 self-published authors (a tiny fraction of this group) the average amount of money earned in 2011 was $10,000 and half of those surveyed earned less than $500. If any of you have been following the forums on amazon.com or Kindleboards these stats probably won’t surprise you. Sure, there are many success stories of authors doing far better than $10,000, but there are even more who aren’t despite good promotion efforts. Here’s another interesting tidbit from the study. Romance authors earned 170% more than those writing in other genres. Science fiction writers earned 38% of that $10,000 income, fantasy writers earned 32%, and literary authors just 20%. Mystery/thriller writers weren’t even mentioned in the study, so I have no idea where we stand. While self-publishing is still flourishing, it’s not a dream come true for everyone, but it certainly seems to offer more writers the opportunity to make money and gain readers than they would have if their manuscripts were still languishing on that slush cart. I spent the last two days with the Southern Indiana Writers Group at an outdoor family fair. Vendors of arts, crafts, snacks, cottage-industry products, and plants set up booths around the Howard Steamboat Museum in Jeffersonville, Indiana. They also have Authors' Row, where local authors and publishers hawk their wares. It's a great place to people-watch. They pass, in all shapes and sizes and varieties of clothing. Sometimes they linger by our booth, where we offer nearly 20 years worth of our group's anthologies, covering themes from dragons (DRAGON: OUR TALES) to the far future (FUTURE PERFECT (TENSE IN SPACE)). It's always interesting to see who is attracted to which covers, who thumbs through which book, who buys what. GHOSTS ON THE SQUARE ... AND ELSEWHERE always garners a lot of attention, and often leads to an exchange of spooky experiences. Since the stories are set in Corydon, Indiana, it often also leads to conversations of the "My people are from ... Do you know ... We lived in the house across from ..." variety, which are my meat. One of our buyers on Saturday was the guy one of our daughters bought her house from, and who taught all our kids and oldest grandson in high school. Then there are the people we stop, so we can ooh and aah over their shirts or hats or tattoos or dogs or babies. But it isn't only the ones who stop who are material for stories and characters. One woman passed who will definitely have a story; I've already started it. If you're a writer: Please, never be bored! The people around you are each the main character in his or her own story. Each is a character -- main character or bit character -- in other people's lives. And, no matter how long you've known any person, the story you "know" is not the story they live. On top of that, there are an infinite number of stories that would be possible. An infinite number of possible futures, just given what you know (or think you know) about each person. Today, I get to take my mother's cat to the vet. I can hardly wait to see who happens. Is Publishing More Work Really Better For Authors? Over recent years, I’ve had several interesting discussions with writers, albeit none of them with the big six publishers, who’ve been lamenting over the pressure to write more books quickly. Many felt pressured to write one book a year. Many also discovered that their second or third books didn’t garner the glowing reviews of their first book, often because reviewers thought the plot or characters weren’t as fully developed as they could have been. This was a dilemma, I thought for all writers, however, a recent post by Kristine Kathryn Rusch was a real eye opener. Rusch maintains that as little as three years ago, big six publishers were discouraging their writers from producing too many books, primarily because the cost to produce them was so high. Rusch states that the average midlist novel costs the publisher $250,000 to produce, figuring in the cost of paper, shipping, returns, etc., and that fewer authors were selling enough copies to reach the 4% profit margin the publisher wanted. Therefore, unless the author was a guaranteed superstar, such as Nora Roberts, publishers were reluctant to publish a book every year. Rusch also said that publishers now seem determined to rid themselves of mass market paperbacks by producing fewer of them, opting for trade paperbacks instead. The ebook revolution, however, has changed these publishers’ attitude toward volume. They’ve begun to see the financial gain in publishing ebooks (because many of them aren’t granting their authors large royalties), and they’re jumping on the lets-publish-lots bandwagon that self-publishers have been doing for some time now. Admittedly, much of the drive to publish more comes from readers who want lots of books from their favorite authors. Romance authors, for instance, have been dealing with this for a long time, and it wasn’t uncommon (probably still isn’t) for established authors to write three books a year. To meet the demands of readers (and make more money) big six publishers are now apparently pressuring their writers into writing more ebook novellas or long short stories. Publishers tell their writers that it will help sell their next book. One of the problems with this thinking is not only the pressure to maintain quality work, but the lack of financial benefit for the writer. Rusch points out that these big six, and often bestselling authors (excluding the superstars) are receiving no advances and terrible royalties for their novellas/short stories. In other words, it’s more work for a financial payoff that may or may not happen much further down the road. Rusch says that “every writer gets better terms from traditional publishing on paper formats than they do on e-formats”. And this, folks, is an important aspect about the business of writing that we all need to keep in mind. Traditionally published, established writers are doing more work just to maintain the status quo, but not necessarily seeing the extra dollars in their pockets. Second Wind Publishing invites you to submit an entry to our holiday short story contest. Entries are to be holiday stories of any genre that mention a food of some kind. (The food item can be a focus of the story or simply a prop.) 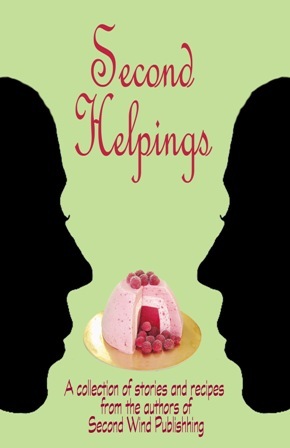 The winner will be included in Second Helpings, a short story/recipe anthology to be released in time for Thanksgiving, Chanukah, Christmas, New Years. So, be thinking of holiday stories with delicious recipes. The story and recipe must be your own original work since the recipe will also be published in the anthology. Plagiarism will not be tolerated. The story must not exist in print form or in any current or upcoming anthology. The story must be no longer than 5,000 words. The contest is open to anyone in the world, 18 or older, though the entry must be written in English. There is no entry fee. The best entries will be posted on the Second Wind Publishing contest blog for everyone to read and comment. The authors and management of Second Wind Publishing will choose the three finalists, but reader comments will be taken into consideration. Entries will be judged on originality, readability, writing skills, characterization, plot, and how well they fit in with the theme of the anthology. Spelling and grammar count. The decision of the judges is final. Everyone is welcome to vote for the winner, which is to be chosen from the three finalists. The winner will be the finalist with the most comments. The winning entry will be published in the upcoming Second Wind anthology, Second Helpings. (Title is subject to change.) The winner will also receive a coupon from Smashwords.com for an unlimited number of free downloads of the anthology for one month. The coupon can be sent to as many people as you wish during that month. The winner will also be able to purchase an unlimited number of print copies of the anthology at half price plus shipping costs. And the winner will receive a one year free VIP account from Angie’s Diary, the online writing magazine to help you get even more exposure for your writing. ($99 value). The contest begins April 1, 2012 and ends June 30, 2012. June 30, 2012 at 11:59 pm ET: Contest ends. Please send your entries as a Word .doc or .docx to secondwindpublishing(at)gmail.com Be sure to replace (at) with @ and use “Holiday Contest” for the subject line. Last week I was on Blog Talk Radio discussing my new non-fiction book Grief: The Great Yearning and explaining why it is important. The basic theme of all my novels is conspiracy, focusing on the horrors ordinary citizens have been subjected to by those in power. Most people who have read the books seem to like them (though a few who didn’t like them seemed befuddled by what I was trying to accomplish). Light Bringer in particular seems to arouse a difference of opinion. Written to be the granddaddy of all conspiracy theories, Light Bringer traces the push toward a one-world government back 12,000 years. Based on myths, both modern conspiracy myths and ancient cosmology myths, Light Bringer is a thriller, or mythic fiction perhaps (if there is such a thing). I never intended it to be science fiction since the science is gleaned from ancient records rather than futuristic imaginings, but that is how it is perceived. Still, despite the scope of Light Bringer, despite it being my magnum opus and the result of twenty years of research, I can’t in all honesty say it is important to anyone except me. It probably won’t change anyone’s life or anyone’s thinking. For the most part, we bring to books what we believe, and so those who believe in conspiracies see the importance of my novels, while those who don’t have even a smattering of belief that there are machinations we are not privy to might even think them far-fetched. So, yes, Grief the Great Yearning is important, and it was good to have a chance to talk about the book and to spread my message: It is okay to grieve. It is important to grieve. And as impossible as it is to imagine now, you will survive. Are Agents Still Good for Writers? Not that long ago, and perhaps for some writers today, a writer’s goal was to land a top agent who could sell their manuscript to big six publishers, obtain foreign rights, movie deals, and get the best possible contract for each. But things began to change. Recession made publishers more “risk adverse” and therefore less likely to take on new writers unless their books had obvious bestseller potential. The ebook and self-publishing revolution enabled thousands of writers to reprint their backlists, or publish new work without going through the long ordeal of acquiring an agent and publisher. Writers began to wonder if there was any point to having an agent? The answer is both yes and no, depending on the writer’s dreams and desires. I have plenty of anecdotal information about my and colleagues’ experiences with agents, and most of it hasn’t been great, but I repeat, this is anecdotal only. A recent blog by Dean Wesley Smith, talking about agents, caught my eye, and no, he wasn’t agent bashing. In part, it was stupid writer bashing. What he did say about agents, though, was interesting. The bottom line, Smith says, is that agents stopped working for writers years ago and began working for publishers, unofficially, of course. He goes onto say why agents are bad for the smart writers of the world: ie., taking part of their copyright, having complete control of funds going in and out, etc. He also says that the AAR (an American association many agents belong to) doesn’t like the lawsuit the Department of Justice filed against publishers and Apple for colluding to keep ebook prices high (see my blog of March 11, “Ebook Pricing Issues Could Wind Up in Court”). I'd love to hear your thoughts about agents. Good, bad, or indifferent! Ah yes, it’s that time of year again, the month when we crime authors celebrate what we do for a living, or try to. It’s practically a motto among many of us that crime doesn’t pay, nearly enough. At least we're good at spreading the word that crime writing is alive and well in Canada. This month, I have, or will be, participating in events to help raise our profile. Yesterday at the Victoria Public Library’s central branch, we held a day-long event of panel discussions and an interactive mini Toastmasters session moderated by Robin Spano. It was terrific to see so many audience members bravely stand in front of the panel and read snippets of their work and then face critique. It was helpful for all of us who have to get up there and read aloud from time to time. Also this month, Crime Writers of Canada is being featured on CBC’s Canada Writes website, and will be posting writing tips from several members throughout the month. Yesterday was my turn, and my 100 words on writing the big scene is now up there for the world to see. You can find it at http://www.cbc.ca/books/canadawrites/2012/05/debra-purdy-kong-the-big-scene.html Below the tip, you’ll find a link to more writing tips.